John’s unfortunate departure in 1746 came as a result of a common infectious disease, which most Native Americans were highly susceptible to due to the lack of history of such a disease prior to the landing of the first explorers’ ships. Infectious diseases spread from person to person, with and without direct human contact, were the first to take the lives of many Native Americans. Due to the absence of these highly contagious diseases prior to European contact, Native Americans lacked an immunity to these illnesses. The result of becoming infected with these illnesses was often deadly, if not disabling. Generally speaking, the most deadly example of this type of disease was small pox, followed by measles. As shown in a previous essay reviewing John’s health, there is strong evidence suggesting John had some sort of severely debilitating condition such as mid to late stage rheumatic disease complicated by severe knee arthritis and heart failure, or some form of old-age onset lumbar spinal (lower back) degenerative disease, complicated by vertebral crushing with fractures and lower back deformity. Each of these could have been complicated by the significant weight gain John experienced due to decreased mobility. John managed to live an eventful life in spite of his disabling condition(s). Every part of this success John had with his health was abruptly halted once the growing political and social pressures in Eastern New York forced him and others to remove to Bethlehem in 1745. This removal put John and others in direct contact with many followers, converts, curious listeners and onlookers who were passing through this heavily populated village setting. The larger number of people living in close association with each other in this part of the colonies increased the likelihood that people already residing there, along with travelers passing through, might infect them with infectious diseases in various stages and forms. Those who were the first to be infected by these diseases were also the most active and vocal members of this community, leaders like John and his close associates Benjamin (Schabat, his associate when they first met Rauch) and Isaac (his “servant”). One of the chief signs of sacrifice John demonstrated was his ability to remain true to his cause, without allowing a fear of contagion or ‘bad spirits’ on behalf of the Creator to prevent him from his evangelical endeavors. His ability to overcome his other debilitating condition may have been the primary reason for this fortitude he possessed when it came to his overall health. In spite of his body’s overall decaying state, Brother John’s spirit remained intact. Our Lady of Lourdes, a saint for all form of sickness. St. Vitus, the patron saint of dancers, affiliated with treating Saint Vitus Dance, Sydenham’s Chorea, or dancing mania. St. John of God for the health of the heart. Whereas the Saints’ practices represent a merging of the physical world with the metaphysical world, some of these practices have strong characteristics indicative of both. For combined American Indian-European traditions, we once again find Saint Patrick serving as a good example. Famous for taking the snakes out of Ireland, were such a story about Saint Patrick told to the Native Americans, they could no doubt draw parallels between this story and the local legends and tales Native Americans had regarding local snakes and the ability of a snake’s spirit to enter the body through its the holes produced by long fangs, resulting in a series of events characteristics of becoming the snake: the mottling our skin, a desire to fall to the ground, the ability to convulse like a snake on a hot rocky surface. Even though in a modern sense, the threat of the venomous snake was not really present in Ireland, this alone did not matter. There was more to the bite than being just being poisoned by venom. There was also the potential threat of some sort of metaphysically based problem coming to surface from within due to the presence of snakes. We can liken this part of the natural history to the Native American legends about the ways in which the animal spirit within snake bites can be halted through the use of ‘snakeroot medicines’ , a topic also discussed briefly in an earlier chapter on the Moravian missions and in considerable detail in my work on New York Lieutenant Governor Cadwallader Colden. Colden’s influences on this part of American medical history are based on his theory that non-venomous Black Snake could be just as potent and fatal to its victims as the venomous rattler or copperhead. In terms of a local European take on this overly spiritually based remedy for snake bites, recall that Colden explained such cures based on his theory that the Black Snake has unique powers, resulting in its ability to charm its potential victims before taking their life, with or without the presence of venom. Blessed Hermann the Cripple, who had a cleft palate, cerebral palsy, and spina bifida, and yet still became a scholar in astronomy, math, history, and theology and was versed in several languages. Blessed Ambrose Sansedoni of Siena who was so deformed and crippled that he was left with a nunnery, only to recover and later study under Thomas Aquinas. In terms of cultural background and impressions, these two Blesseds are very different from Tschoop in terms of overall life experience. Their Blessedness serves as proof that physical debility or disability are not the ultimate cause for personal inability. Accomplishments can be made by saints no matter what their physical limitations, so long as their cause is spiritually sound, deliberate and well directed. St. Jude for the sense of hopelessness. The social purposes served by an individual of spiritual importance to a community are easy to obtain evidence once the individual is defined as “gifted”. If we assume for the moment that Tschoop or Brother John is in fact gifted, then a number of features related to his gift stand out. When identifying, interpreting and visualizing these gifts, we are left with answers to the following questions: Did John live an exemplary life, engaged in activities worth imitating? Did he experience an eventful life, only to experience an untimely death due to these efforts? Is he an excellent example of why conversion is so important, resulting in the abandonment of a previous immoral lifestyle? These are the three basic questions asked whenever someone is evaluated for possible sainthood. Tschoop’s life before his conversion made him appear to best fit the third or last qualifying feature for becoming a Beatus. His life practices made him better fit the first qualification. The reasons for his martyrdom finalized by a small pox epidemic made him also fit the second requirement. In essence, a community leader like John has gone through some tragic and at times desperate life experiences that are not atypical of others who are later beatified or canonized. In spite of his illness and the related physical debilitation, John continued his work as a spiritual leader for his people, with little concern for his own physical betterment. 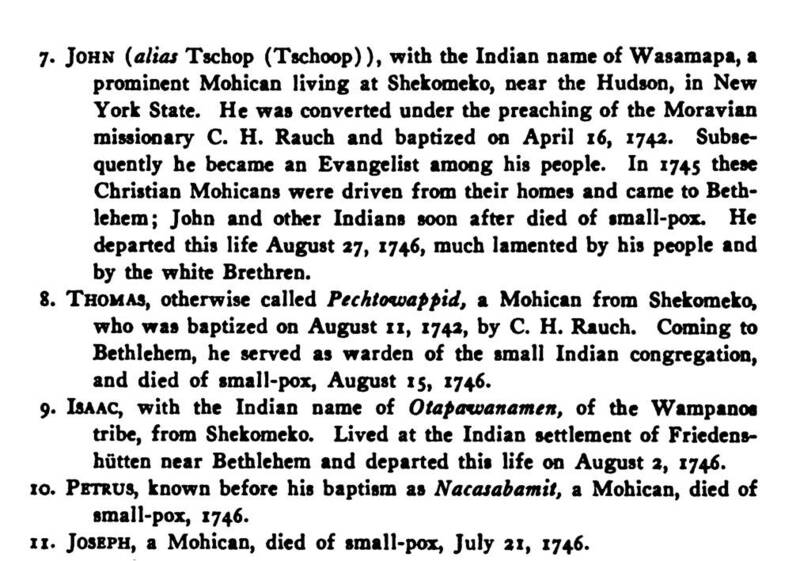 Moreover, when he along with others had to finally leave Shekomeko, NY, in 1745/6, he and the others removed to Bethlehem. This put John in close contact with numerous others, especially those from other hamlets, villages, towns and cities whom he had lived a fair distance from for much of his life. Now he was able to experience one of the true consequences of such a social exposure. The risk of such interactions with other colonists was probably of little concern to John and his followers. Due to the limited epidemiological knowledge that existed at the time about some of these worst diseases, fear was not easily generated in those who were most faithful and trusting of their own fate when it came to the Creator. At the time, a number of highly infectious diseases were known to take their tolls on the Native Americans, due to their high rates of spread from person-to-person. The two most important examples of these diseases were measles and small pox, but there were also some like roseola, rose fever, mumps, rubella, and others that could take the lives of children as well at very young ages. In spite of such risks, Brother John and others took this path in life regardless of potential consequences. During the summer of 1746, these consequences finally took shape in Brother John’ s life. By August 28th, 1746, John was deceased along with many others due to an ongoing epidemic of small pox, repeatedly striking the Moravian Indian community in several waves. John’s age when death arrived is unknown, but may be as early as during his 50s, and as late as his 80s. He is buried along with the other victims of this unique “gift” in the Moravian cemetery in Bethlehem, Pennsylvania.